The York County Sheriff’s Department sent out the attached alert for a missing child who lives on Big Bethel Road in the Tabb area of York County. The child, Linnie W. Cain III, was reported missing 5/14/12. As of 1:30 p.m. today, the child has not been found. There is no indication of foul play but the Sheriff’s Office is on full alert for all calls. The Sheriff Office has established a command post at the St. Kateri Catholic Church across from Tabb Elementary School and is organizing a search of the large wooded area along Big Bethel Road. If you would like to help out with the search, please report to the command post at the St Kateri. If you have any information concerning the child, please contact the Sheriff’s Office at 890-3621. 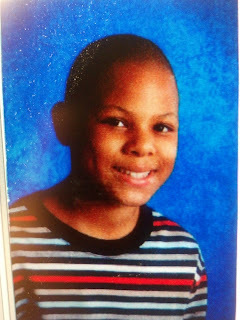 York County, VA- York-Poquoson Sheriff’s deputies are seeking the public’s assistance in locating a missing child. On 5/14/12 at 8:56 p.m., dispatch received a call that Linnie W. Cain III had not been seen since approximately 8:00 p.m.. Linnie, who goes by “Trey” is described as a 12 year old light-skinned black male, approx. 5’3, 90lbs. and was last seen wearing a blue and grey horizontal striped polo shirt, navy jean shorts with cargo pockets on the sides and possibly no shoes. He was last seen in his yard in the 3200 block of Big Bethel Road in the Tabb area of York County. A search utilizing members of the Sheriff’s Office, Fire Department and several K9 units from Hampton PD was conducted, however, at this time Treys whereabouts are still unknown. Anyone with information is asked to call the Sheriff’s Office at 890-3621.